Hi Guys! In this post I talk about; three projects in progress and how I made the wrong paint color choice three times, the winners of the stencil giveaway and the craft giveaway, the new Petticoat Junktion video page, the vintage kitchen scale I received from a reader, and flowers yet to be potted. Have you ever selected the wrong paint color for a project? Or maybe the color is okay but just needs a bit of tweaking? I’ve definitely run into this problem before. My paint color choice on the last three projects leaves a little bit to be desired but I think with tweaking the projects will be okay. I just might need a little guidance from you. 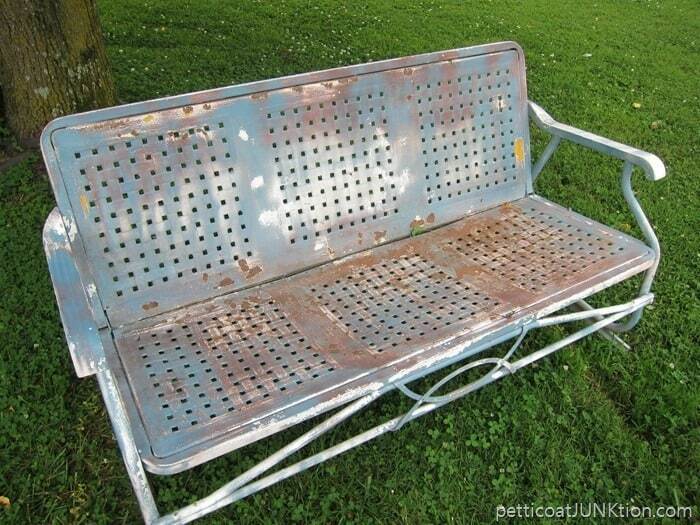 Remember this glider from the junk shop? I brought it home and the JTS used a wire brush to remove the loose paint then I went over it with sandpaper. 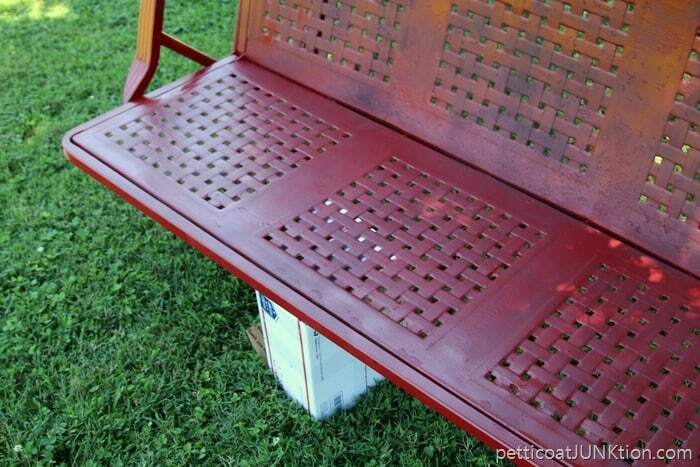 Next I sprayed black Rustoleum rust reformer on the rusty spots. I couldn’t decide what color to paint the glider. Turquoise or yellow were my top picks. I bought spray paint at the store and sprayed a bit of each color on the bottom of the glider. Not feeling either color. The yellow was too yellow and the turquoise was too blue. I finally settled on this Cherry Red from Krylon. I love the color but the coverage is not real good. It’s not the spray paint it’s the roughness of the glider. I think the arms and the decorative front panel are a different metal than the rest of the glider. They have a smoothness that the body of the glider doesn’t have. The paint covered these areas really well. I chose to use spray paint because I thought the job would be easy. It was easy but the finished look doesn’t do it for me. 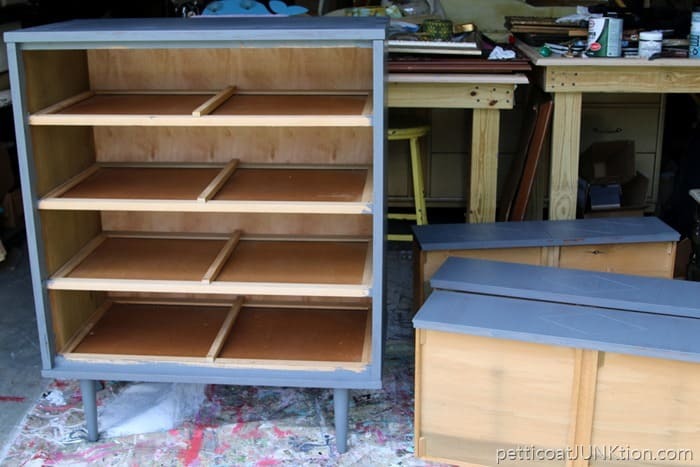 I’m also thinking I want a mustardy yellow color for the finish. 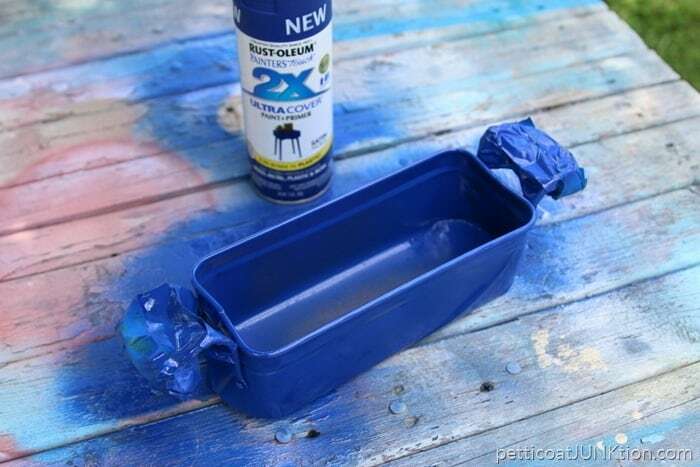 My HomeRight paint sprayer filled with exterior latex paint might be the answer. Could get better paint coverage that way. 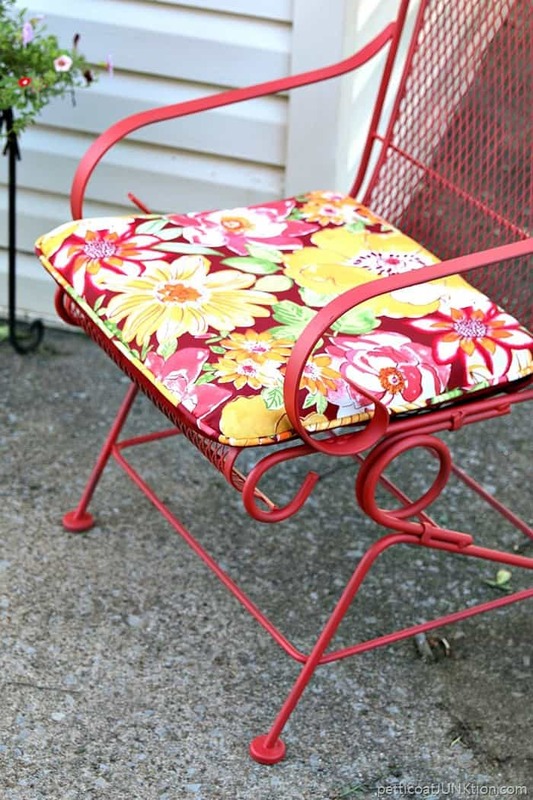 The outdoor cushions I got for the glider are just like the one for the wrought iron lawn chair I painted with Krylon Scarlet Chalky Finish. 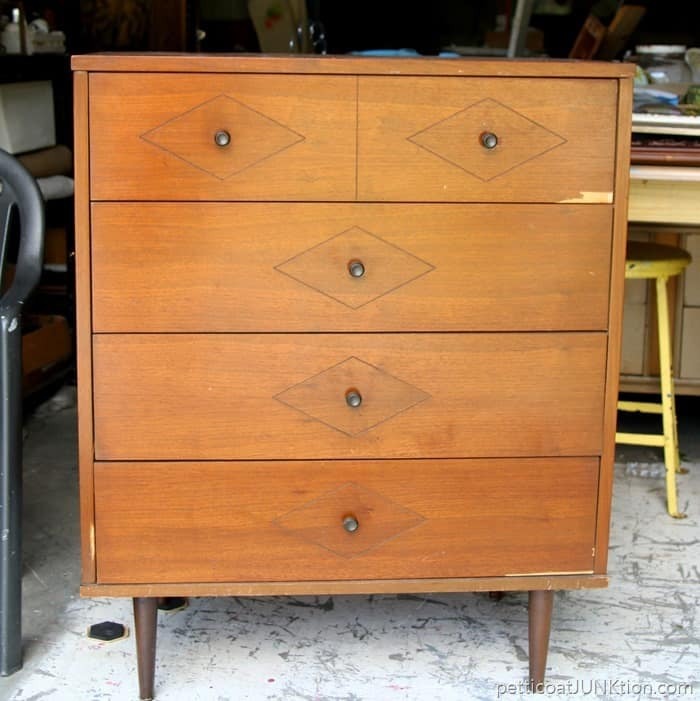 Next project up is the mid century piece I bought in Metropolis for $17.50. It was backless and the JTS cut a back for it. 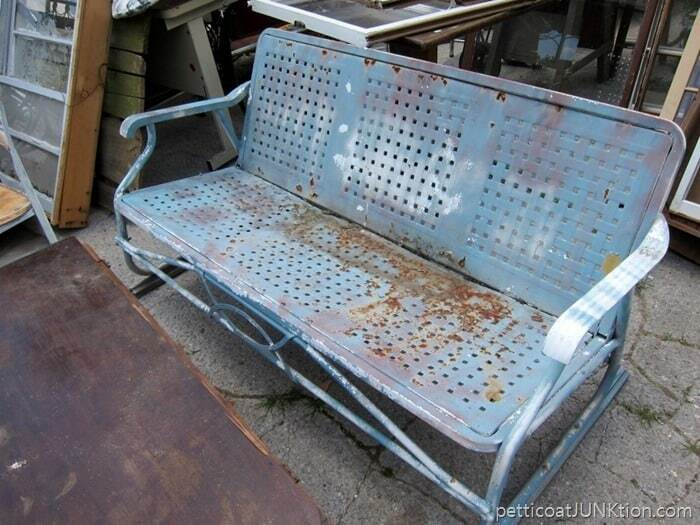 I chose Beyond Paint in Pewter for the finish and I like the color but I want to add a little pizazz. These are the knobs that inspired the makeover. Blue and gray compliment each other right. The knobs came from Tuesday Morning. 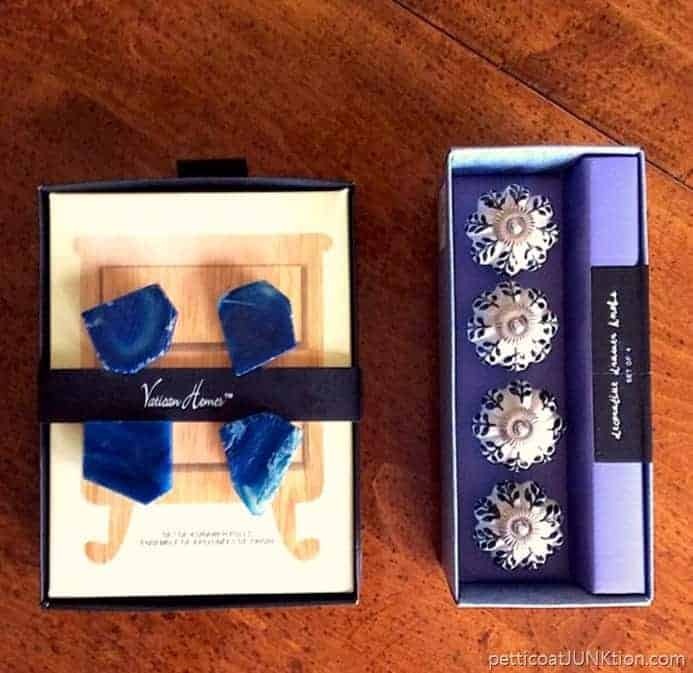 I fell in love with the agate ones but they only had the one set. Anyway, I think I need to add a wash or another color to the gray on the chest. What do you guys think? This project is small but could make a big statement if I get the color right. 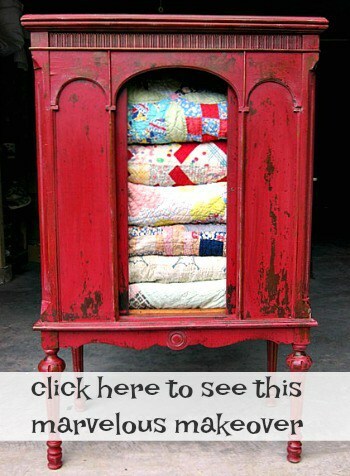 I used to have pieces like this in the 70’s…..copper with blue and white porcelain handles or knobs. I remember a teapot in particular. Anyone else. This is my first attempt at painting the brass. The color is pretty and what I thought I wanted. I removed the painters tape from the handles and took the pot in the house but the color is too dark for me. Maybe a lighter blue or I guess I could go red……hummmm. 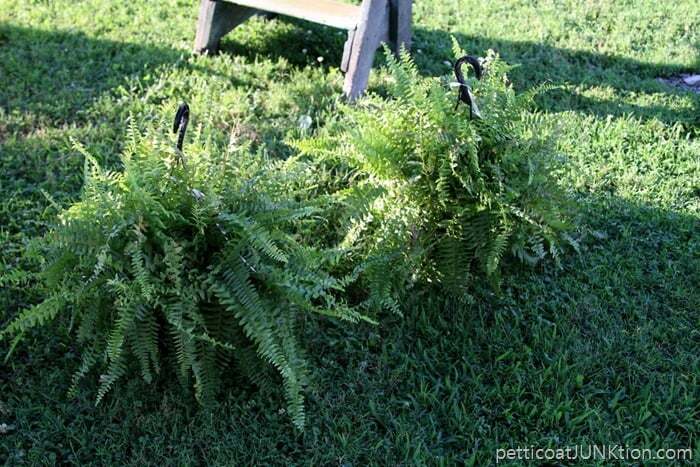 I bought the ferns on sale at Walmart. And also a few flowers. 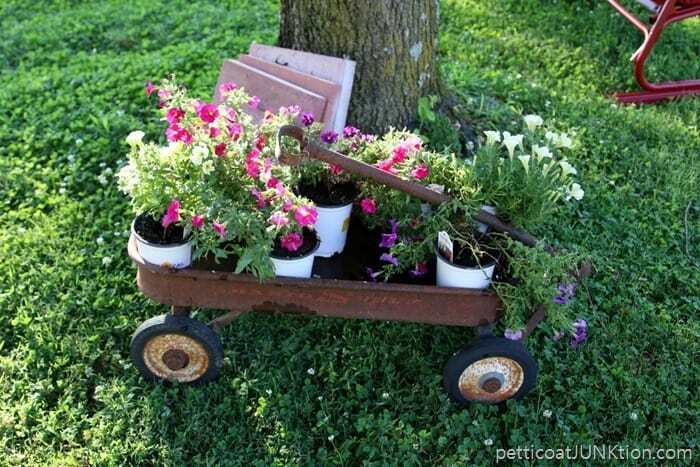 Now I just have to plant them in my rusty wagon. It’s going to be so cute! 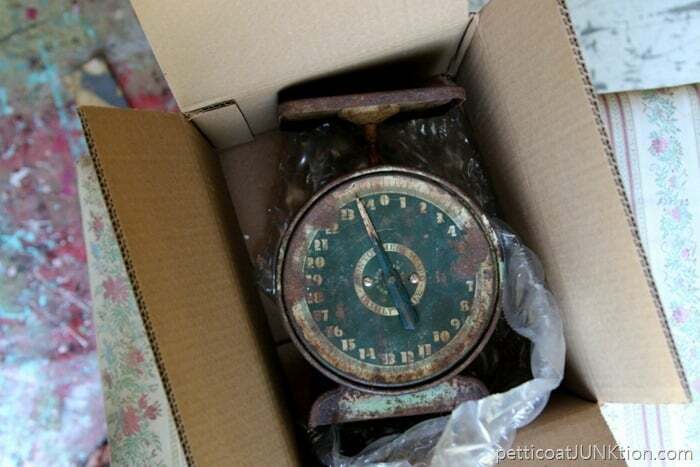 A sweet, sweet, reader named Nancy F. sent me the vintage kitchen scales. Isn’t that the nicest thing. 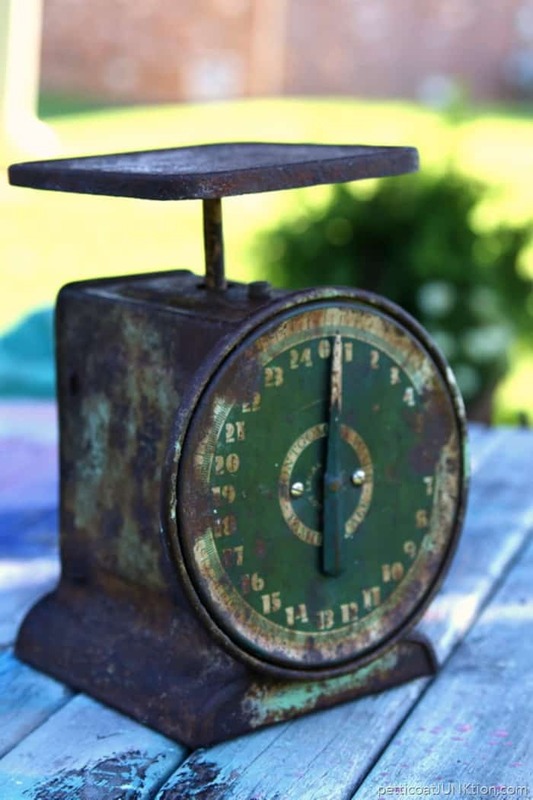 She’s downsizing her junk stash and read that I collected kitchen scales. 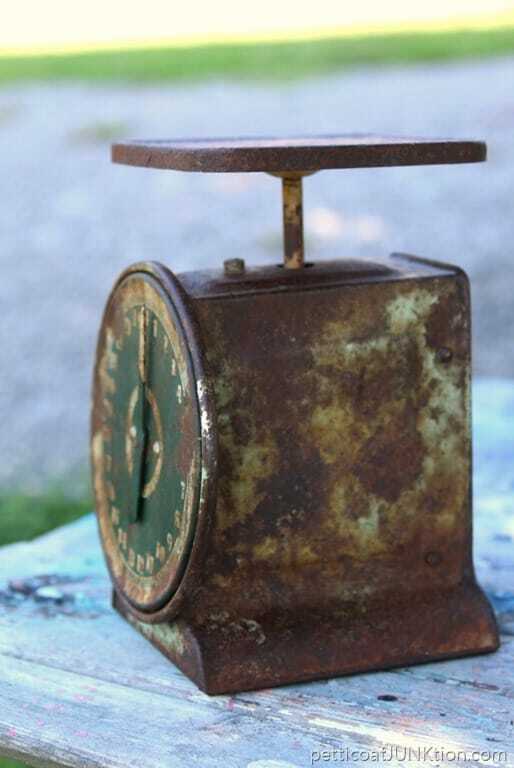 I like the rust as is so I just coated the scales with clear wax. The green is perfect and fits my color scheme to a T.
The winner of the July craft giveaway is…. 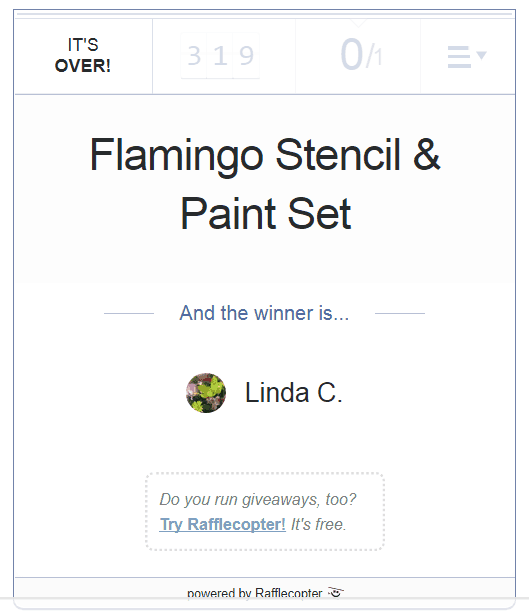 And the winner of the Flamingo stencil kit is….. Most of you know I put together a few video tutorials but you may not know that I have a whole new page dedicated to them. I plan to do more videos. They’re a great teaching tool. Much easier to understand than a flat photo. 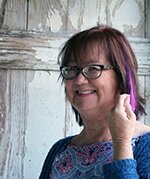 You can see my video page here…Petticoat Junktion Video Tutorials or just click My Videos on the menu bar. I love Cherry Red Krylon. My favorite color. I spray many of my outside items with it, Red is my go to color to brighten up my porch. Love the red chair and cushion!!!!! Everything looks so cute and I love the colors. Those knobs are absolutely gorgeous!!! Thank you Rose! I love the knobs too, just hope I can come up with the perfect paint finish. Thank you for sharing your “mistakes!” It helps me realize that I can try something and if it doesn’t work I can just fix it! I like the color of the swing. The dresser needs something but I’m not sure what! If the pot is copper I would take the paint off. If it’s brass, I’d paint it something more muted and “old” looking. The pot is copper. Not sure yet what I’m going to do with it but I don’t like the blue paint. Maybe take most of it off. I make all kinds of mistakes I don’t share! I love your blog. My favorites parts are when you get it wrong and admit it. It’s nice to know that someone other than me guesses wrong on colors! Thanks for keeping it REAL! I guess I should share more of my “got it wrong the first time” projects. I get it wrong a lot. Thanks for the nice compliment on my blog. 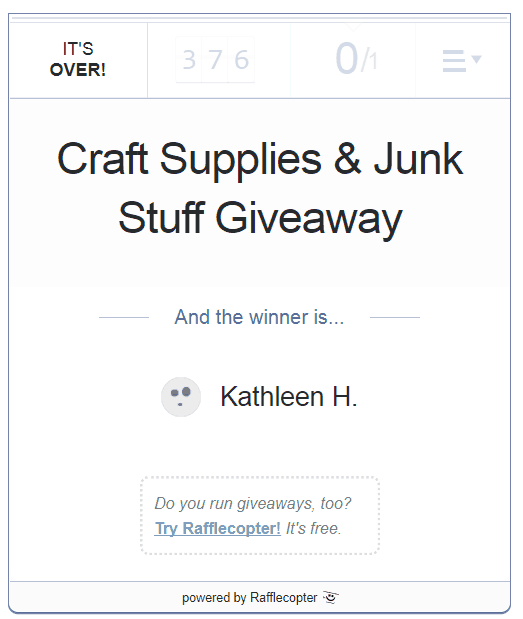 Love the giveaways and your stories. Wish I also had a sweet friend like Nancy F! I’ll keep them coming. I just wish everyone could win. I enjoy what you share and especially love that you keep it real, whether it’s about redoing a paint job because of color, or your greenish thumb! I love the pictures you share at your favorite picking spots too! Thanks Kaycee. I hope to share some pickin’ photos tomorrow. 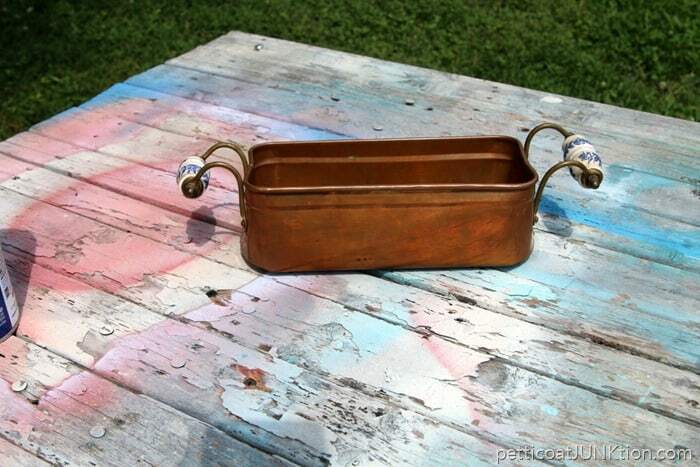 I love painted items but not over true copper! 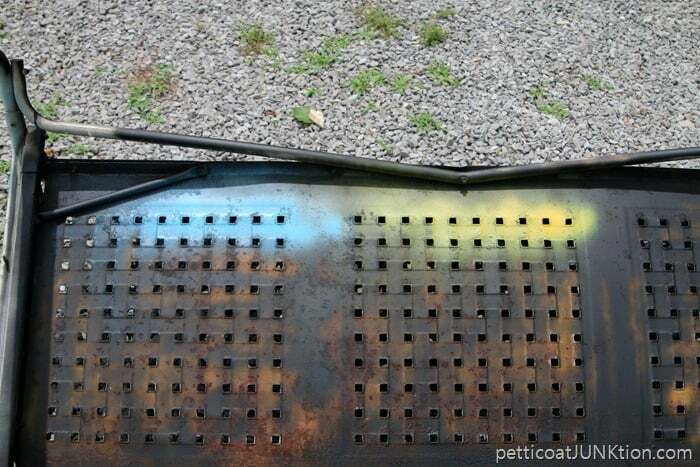 I suggest you remove most of the paint leaving a “paint-distressed” look with most of the copper showing through. Metallics are big and copper is a great accent! If the original pot was really brass (as stated under second photo), paint may not be so bad but it is a matter of choice. Kathy, if you use a circular sander you might get a great result with a blue and copper finish! Sometimes accidents net interesting results. I love the giveaways! I used to stencil a lot but I don’t have any now. Want to get back into it. It’s so much fun! Yes, stenciling is great. I can’t paint otherwise!